These birds really go out on a limb! A male Montezuma Oropendola holds forth in a tree bedecked with twenty or more hanging nests. 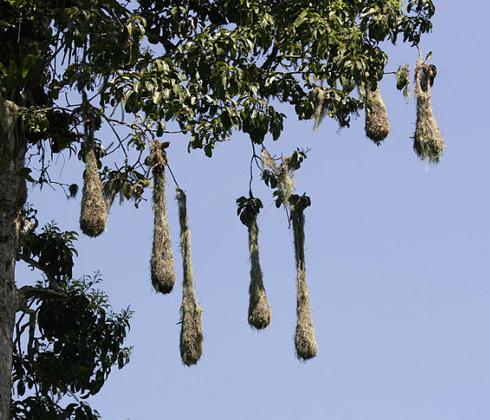 The nests are intricately woven sacks hanging three feet or more from the branches. Oropendolas favor trees that are separate from other trees and often build near large nests of wasps, whose stinging attacks deter both potential nest predators and parasitic insects. You can learn more about the Oropendola at Rainforest.org. Oropendolas are not just colonial nesters. They’re very choosy about the trees in which they nest. They prefer a tall tree, separate from other trees, to discourage troops of hungry monkeys that are wary of crossing open ground. The female oropendolas weave their nests near the tips of branches so slender that their limberness makes access difficult for nest-raiders. It takes about ten days to complete the nest. Call of the Montezuma Oropendola #89453 provided by The Macaulay Library of Natural Sounds at the Cornell Lab of Ornithology, Ithaca, New York. Recorded by C. Duncan.